As project management has evolved and matured, so has the executive's role in project management. To ensure the success of individual projects and the organization as a whole, today's executives are increasingly involved in activities such as capacity planning, portfolio management, prioritization, and strategic planning specifically for project management. In fact, more and more executives are becoming certified Project Management Professionals (PMPs). What Executives Need to Know About Project Management offers executives a guide to project management, focusing on what they need to know and what they need to do. It provides step-by-step guidance to help executives get effective, well-resourced project management teams in place and ensure the success of any individual project. Next, the book explores how executives serve as executive sponsors in project management teams, setting forth solutions to the many problems and challenges they face in this role, including managing disagreements, delegating authority, and accelerating projects. The authors explain how the role of the executive sponsor changes depending upon the life-cycle phase of the project. For example, during the project initiation and planning phases, the sponsor may take on a very active role, ensuring that proper objectives are established and that the project plan satisfies the needs of the business as well as the needs of the client. 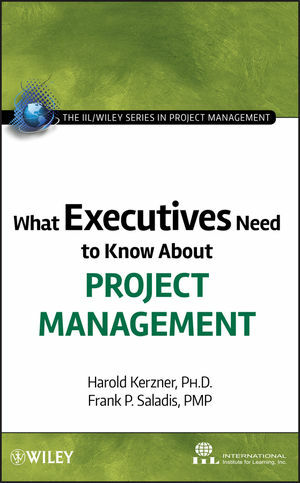 During the execution phase, the sponsor may take on a less active role; however, the book shows how executive sponsors need to become involved when roadblocks appear, crises occur, and conflicts arise over priorities among projects. Throughout the book, helpful illustrations clarify complex concepts and processes. HAROLD D. KERZNER, PH.D., is Senior Executive Director at the International Institute for Learning, Inc., a global learning solutions company that conducts training for leading corporations throughout the world. He is a globally recognized expert on project, program, and portfolio management, total quality management, and strategic planning. Dr. Kerzner is the author of bestselling books and texts, including the acclaimed Project Management: A Systems Approach to Planning, Scheduling, and Controlling, Tenth Edition. FRANK P. SALADIS, PMP, is a Senior Consultant and Trainer for the International Institute for Learning, Inc. and editor of the allPM.com newsletter, a global project management publication. Mr. Saladis was awarded the 2006 Linn Stuckenbruck Person of the Year Award by the Project Management Institute. The award recognizes people who have made significant contributions to the Institute as leaders in project management. Mr. Saladis is the originator of International Project Management Day, held each year to celebrate and recognize project managers from around the world. INTERNATIONAL INSTITUTE FOR LEARNING, INC. (IIL) is a global leader in professional training and comprehensive consulting services in the areas of project, program, and portfolio management, PRINCE2®, business analysis, Microsoft® Office Project and Project Server, and Lean Six Sigma. IIL is an IIBA-endorsed education provider, a PMI® charter global registered education provider, and a member of PMI's Silver Alliance Circle and Corporate Council.